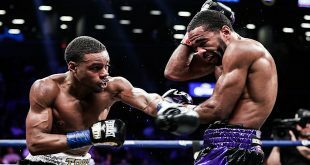 Former light heavyweight world champion Jean Pascal(32-5-1, 19 KOs) scored an impressive stoppage of previously unbeaten Ahmed Elbiali(16-1, 13 KOs) in the sixth round of the main event of a special Friday night edition of Premier Boxing Champions "Toe To Toe Tuesdays" on Fox at Hialeah Park in Miami, Florida. "It was a beautiful fight," said Pascal. "I knew it would be my last one and I wanted to make a statement against a young, unbeaten fighter. It went basically as I expected, a couple of difficult moments but I was able to do everything I wanted." Elbiali stuck to his strategy of walking down Pascal with power shots, but exhausted too much energy in doing so while not being able to seriously hurt his opponent. Pascal's counters grew stronger as the fight went on and Elbiali lost steam on his punches as he entered the sixth round for only the fourth time in his pro career. After an impressive round five, Pascal poured on the attack in round six, landing numerous unanswered hooks before Elbiali's corner called for a stop to the fight at 2:06 into the round. "I fought his fight, I should have boxed more and taken him into the later rounds," said Elbiali. "It wasn't my day. He is a world class fighter. I felt like I hurt him in the first round, but I felt drained after that. I'm not sure why, it might have been the nerves. But I'll learn from this." 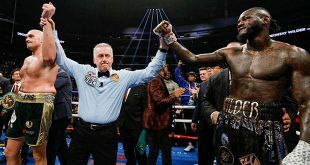 The co-main event of the telecast saw top heavyweight contender Luis "King Kong" Ortiz (28-0, 24 KOs) deliver a second round knockout of Daniel Martz (16-6-1, 13 KOs) and swiftly call out heavyweight world champion Deontay Wilder, who had joined the FS1 broadcast ringside. "I've wanted you and I'm going to bless you again with another opportunity," said Wilder. "I was ready the first time. This is a new day for you. I think you're one of the best heavyweights in the world and I want to prove that I am the best. We must fight each other. You will have your fight." "Anthony Joshua doesn't want to fight either of us, let's give the world this fight," said Ortiz. "There will be no excuses. I will be ready to do this for Cuba!" "I felt pretty good about the fight," said Perrella. "There are some things I'd like to have done different, but considering I was out for 15 months and injured for a long time, I'm pleased with what I was able to accomplish. I didn't get the knockout after hurting him, but I was able to handle him better than anyone else before me." 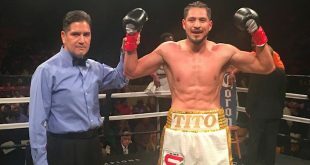 The opening bout of the telecast saw a battle of unbeaten featherweight prospects as Philadelphia's Stephen Fulton (12-0, 5 KOs) earned a majority decision victory over Adam Lopez (8-1, 3 KOs). "I worked hard to get the win," said Fulton. "I had to adjust after the first two rounds but I took the fight to him and controlled the pace. He thought he had me hurt in round two, but it wasn't anything. He landed a good shot but that was it. I never stressed about how the fight would turn out as long as I stuck to the game plan."